Diatom is the common name for a major group of unicellular or (less commonly) colonial algae comprising the protist taxon Bacillariophyceae (or Bacillariophyta), characterized by unique cell walls of silica (hydrated silicon dioxide). Called a frustule, these cell walls usually consist of two overlapping and interlocking asymmetrical sides with a split evident between them, hence the group name "diatom," which comes from the Greek διά (dia), meaning "through," and τέμνειν (temnein), meaning "to cut," and thus "cut in half." Most diatoms are microscopic. The silica shells (frustules) of diatoms show a wide diversity in form, some quite intricate and ornate. The beauty of these organisms, as observed through a microscope, have lead to their being called "jewels of the sea." These eukaryotes are one of the most common types of phytoplankton. They are found in large numbers in almost all waters of the world, freshwater and saline, and also are found in moist soil and in the moisture on plants. Ecologically, they are very important, serving as the base of the food chains for many animals, particularly in ocean environments where they are responsible for a lot of the primary production. In addition, diatoms are the source of much of the petroleum and their deposits form diatomaceous earth, which is used for insulation, making dynamite, a filtration aid, mild abrasives, an absorbent for liquids, cat litter, and other purposes. Living diatom communities are a popular tool for monitoring environmental conditions, past and present, and are commonly used in studies of water quality. Fossil evidence suggests that diatoms originated during, or before, the early Jurassic period. Diatoms are a type of heterokont (phylum Heterokontophyta), a major line of eukaryotes that includes both autotrophs (e.g. golden algae) and heterotrophs (e.g. water molds). Most are algae, ranging from the giant multicellular kelp to the mainly unicellular diatoms. Heterokont algae have chloroplasts that are surrounded by four membranes. Counted from the outermost to the innermost membrane, the first membrane is continuous with the host's chloroplast endoplasmic reticulum, or cER. The second membrane presents a barrier between the lumen of the endoplasmic reticulum and the chloroplast, which represents the next two membranes, within which the thylakoid membranes are found. This arrangement of membranes suggest that heterokont chloroplasts were obtained from the reduction of a symbiotic red algal eukaryote. The chloroplasts characteristically contain chlorophyll a and chlorophyll c, and usually the accessory pigment fucoxanthin, giving them a golden-brown or brownish-green color. There are more than 200 genera of living diatoms, and it is estimated that there are approximately 100,000 extant species (Round and Crawford 1990; Canter-Lund and Lund 1995). Most diatoms are unicellular, although they can exist as colonies in the shape of filaments or ribbons (e.g. Fragillaria), fans (Meridion), zigzags (Tabellaria), or stellate colonies (Asterionella). Diatoms are a widespread group and can be found in the oceans, in freshwater lakes and streams, in soils, and on damp surfaces. Most live pelagically in open water, although some live as surface films at the water-sediment interface (benthic), or even under damp atmospheric conditions. They are especially important in oceans, where they are estimated to contribute up to 45 percent of the total oceanic primary production (Mann 1999). Although usually microscopic, some species of diatoms can reach up to 2 millimeterss in length. Diatom cells are contained within a unique silicate (silicic acid) cell wall comprising two separate valves (or shells). Diatom cell walls are also called frustules or tests. The frustule is composed almost purely of silica, made from silicic acid, and is coated with a layer of organic substance, sometimes pectin. The two overlapping sections of the frustule's structure are the epitheca and the hypotheca, with the epitheca overlaping the hypotheca somewhat like the two overlapping halves of a petri dish. This overlapping feature allows for the diatom to achieve limited movement. Also, the overlapping allows for additional internal growth room. The frustules structure also contains many pores and slits that provide the diatom access to the external environment for processes such as waste removal and mucilage secretion. The biogenic silica that the cell wall is composed of is synthesized intracellularly by the polymerization of silicic acid monomers. This material is then extruded to the cell exterior and added to the wall. In most species, when a diatom divides to produce two daughter cells, each cell keeps one of the two valves and grows a smaller valve within it. As a result, after each division cycle the average size of diatom cells in the population gets smaller. Once such cells reach a certain minimum size, rather than simply divide vegetatively, they reverse this decline by forming an auxospore. This expands in size to give rise to a much larger cell, which then returns to size-diminishing divisions. Auxospore production is almost always linked to meiosis and sexual reproduction. The diatom's yellowish-brown chloroplasts are typical of heterokonts, with four membranes and containing pigments such as fucoxanthin. Individual diatomes usually lack flagella, but flagella are present in gametes and have the usual heterokont structure, except they lack the hairs (mastigonemes) characteristic in other groups. Most diatoms are non-motile, although some move via flagellation. As their relatively dense cell walls cause them to readily sink, planktonic forms in open water usually rely on turbulent mixing of the upper layers by the wind to keep them suspended in sunlit surface waters. Some species actively regulate their buoyancy with intracellular lipids to counter sinking. Decomposition and decay of diatoms leads to organic and inorganic (in the form of silicates) sediment. The inorganic component of these sediments can lead to a method of analyzing past marine environments by corings of ocean floors or bay muds, since the inorganic matter is embedded in deposition of clays and silts and forms a permanent geological record of such marine strata. Selections from Ernst Haeckel's 1904 Kunstformen der Natur (Artforms of Nature), showing pennate (left) and centric (right) frustules. The classification of heterokonts is still unsettled, and they may be treated as a division (or phylum), kingdom, or something in-between. Accordingly, groups like the diatoms may be ranked anywhere from class (usually called Bacillariophyceae) to division (usually called Bacillariophyta), with corresponding changes in the ranks of their subgroups. The diatoms are also sometimes referred to as Class Diatomophyceae. Diatoms are traditionally divided into two orders: centric diatoms (Centrales), which are radially symmetric, and pennate diatoms (Pennales), which are bilaterally symmetric. The former are paraphyletic to the latter. 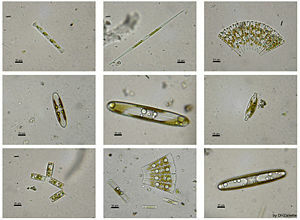 A more recent classification (Round and Crawford 1990) divides the diatoms into three classes: centric diatoms (Coscinodiscophyceae), pennate diatoms without a raphe (Fragilariophyceae), and pennate diatoms with a raphe (Bacillariophyceae). It is probable there will be further revisions as understanding of their relationships increases. Round & Crawford (1990) and Hoek et al. (1995) provide more comprehensive coverage of diatom taxonomy. Diatoms occur in virtually every environment that contains water. This includes not only oceans, seas, lakes, and streams, but also soil. Planktonic forms in freshwater and marine environments often exhibit a "boom and bust" (or "bloom and bust") lifestyle. When conditions in the upper mixed layer (nutrients and light) are favorable (e.g. at the start of spring) their competitive edge (Furnas 1990) allows them to quickly dominate phytoplankton communities ("boom" or "bloom"). As such they are often classed as opportunistic r-strategists (i.e., those organisms whose ecology is defined by a high growth rate, r). When conditions turn unfavorable, usually upon depletion of nutrients, diatom cells typically increase in sinking rate and exit the upper mixed layer ("bust"). This sinking is induced by either a loss of buoyancy control, the synthesis of mucilage that sticks diatoms cells together, or the production of heavy resting spores. Sinking out of the upper mixed layer removes diatoms from conditions inimical to growth, including grazer populations and higher temperatures (which would otherwise increase cell metabolism). Cells reaching deeper water or the shallow sea floor can then rest until conditions become more favorable again. In the open ocean, many sinking cells are lost to the deep, but refuge populations can persist near the thermocline. Ultimately, diatom cells in these resting populations re-enter the upper mixed layer when vertical mixing entrains them. In most circumstances, this mixing also replenishes nutrients in the upper mixed layer, setting the scene for the next round of diatom blooms. In the open ocean (away from areas of continuous upwelling (Dugdale and Wilkerson 1998), this cycle of bloom, bust, then return to pre-bloom conditions typically occurs over an annual cycle, with diatoms only being prevalent during the spring and early summer. In some locations, however, an autumn bloom may occur, caused by the breakdown of summer stratification and the entrainment of nutrients while light levels are still sufficient for growth. Since vertical mixing is increasing, and light levels are falling as winter approaches, these blooms are smaller and shorter-lived than their spring equivalents. In the open ocean, the condition that typically causes diatom (spring) blooms to end is a lack of silicon. 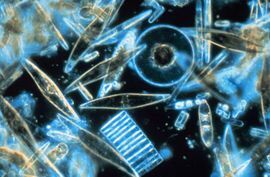 Unlike other nutrients, this is only a major requirement of diatoms and it is not regenerated in the plankton ecosystem as efficiently as, for instance, nitrogen or phosphorus nutrients. This can be seen in maps of surface nutrient concentrations—as nutrients decline along gradients, silicon is usually the first to be exhausted (followed normally by nitrogen then phosphorus). Because of this bloom-and-bust lifestyle, diatoms are believed to play a disproportionately important role in the export of carbon from oceanic surface waters (Smetacek 1985; Dugdale and Wilkerson 1998). Significantly, they also play a key role in the regulation of the biogeochemical cycle of silicon in the modern ocean (Treguer et al. 1995; Yool and Tyrrell 2003). The use of silicon by diatoms is believed by many researchers to be the key to their ecological success. In a now classic study, Egge and Aksnes (1992) found that diatom dominance of mesocosm communities was directly related to the availability of silicate. When silicon content approaches a concentration of 2 mmol m-3, diatoms typically represent more than 70 percent of the phytoplankton community. Raven (1983) noted that, relative to organic cell walls, silica frustules require less energy to synthesize (approximately 8 percent of a comparable organic wall), potentially a significant saving on the overall cell energy budget. Other researchers (Milligan and Morel 2002) have suggested that the biogenic silica in diatom cell walls acts as an effective pH buffering agent, facilitating the conversion of bicarbonate to dissolved CO2 (which is more readily assimilated). Notwithstanding the possible advantages conferred by silicon, diatoms typically have higher growth rates than other algae of a corresponding size (Furnas 1990). For those wishing to collect diatoms for personal observation, living diatoms are often found clinging in great numbers to filamentous algae, or forming gelatinous masses on various submerged plants. Cladophora is frequently covered with Cocconeis, an elliptically shaped diatom; Vaucheria is often covered with small forms. Diatoms are frequently present as a brown, slippery coating on submerged stones and sticks, and may be seen to "stream" with river current. The surface mud of a pond, ditch, or lagoon will almost always yield some diatoms. They can be made to emerge by filling a jar with water and mud, wrapping it in black paper, and letting direct sunlight fall on the surface of the water. Within a day, the diatoms will come to the top in a scum and can be isolated. Furthermore, since diatoms form an important part of the food of mollusks, tunicates, and fishes, the alimentary tracts of these animals often yield forms that are not easily secured in other ways. Marine diatoms can be collected by direct water sampling, though benthic forms can be secured by scraping barnacles, oyster shells, and other shells (Chamberlain 1901). The earliest known fossil diatoms date from the early Jurassic (~185 Ma), although molecular clock and sedimentary evidence suggests an earlier origin (Kooistra and Medlin 1996; Schieber et al. 2000). It has been suggested that their origin may be related to the end-Permian mass extinction (~250 Ma), after which many marine niches were opened (Medlin et al. 1997). The gap between this event and the time that fossil diatoms first appear may indicate a period when diatoms were unsilicified and their evolution was cryptic (Raven and Waite 2004). Since the advent of silicification, diatoms have made a significant impression on the fossil record, with major deposits of fossil diatoms found as far back as the early Cretaceous, and some rocks (diatomaceous earth, diatomite) being composed almost entirely of them. Although the diatoms may have existed since the Triassic, the timing of their ascendancy and "take-over" of the silicon cycle is more recent. Prior to the Phanerozoic (before 544 Ma), it is believed that microbial or inorganic processes weakly regulated the ocean's silicon cycle (Siever 1991; Kidder and Erwin 2001; Grenne and Slack 2003). Subsequently, the cycle appears dominated (and more strongly regulated) by the radiolarians and siliceous sponges, the former as zooplankton, the latter as sedentary filter feeders primarily on the continental shelves (Racki and Cordey 2000). Within the last 100 million years, it is thought that the silicon cycle has come under even tighter control, and that this derives from the ecological ascendancy of the diatoms. However, the precise timing of the "take-over" is unclear, and different authors have conflicting interpretations of the fossil record. Some evidence, such as the displacement of siliceous sponges from the shelves (Maldonado et al. 1999), suggests that this takeover began in the Cretaceous (146 Ma to 65 Ma), while evidence from radiolarians suggests "take-over" did not begin until the Cenozoic (65 Ma to present) (Harper and Knoll 1975). Nevertheless, regardless of the details of the "take-over" timing, it is clear that this most recent revolution has installed much tighter biological control over the biogeochemical cycle of silicon. Heterokont chloroplasts appear to be derived from those of red algae, rather than directly from prokaryotes as is believed to have occurred in plants. This suggests they had a more recent origin than many other algae. However, fossil evidence is scant, and it is really only with the evolution of the diatoms themselves that the heterokonts make a serious impression on the fossil record. The entire genome of the centric diatom, Thalassiosira pseudonana, has been sequenced (Ambrust et al. 2004), and the sequencing of a second diatom genome from the pennate diatom Phaeodactylum tricornutum is in progress. The first insights into the genome properties of the P. tricornutum gene repertoire was described using 1,000 ESTs (Scala et al. 2002). Subsequently, the number of ESTs was extended to 12,000 and the Diatom EST Database was constructed for functional analyses (Maheswari et al. 2005). These sequences have been used to make a comparative analysis between P. tricornutum and the putative complete proteomes from the green alga Chlamydomonas reinhardtii, the red alga Cyanidioschyzon merolae, and the centric diatom T. pseudonana (Montsant et al. 2005). The deposition of silica by diatoms may also prove to be of utility to nanotechnology (Bradbury 2004). Diatom cells repeatedly and reliably manufacture valves of particular shapes and sizes, potentially allowing diatoms to manufacture micro- or nano-scale structures that may be of use in a range of "widgets" including: optical systems; semiconductor nanolithography; and even using diatom valves as vehicles for drug delivery. Using an appropriate artificial selection procedure, diatoms that produce valves of particular shapes and sizes could be evolved in the laboratory, and then used in chemostat cultures to mass produce nanoscale components (Drum and Gordon 2003). Armbrust, E. V., J. A. Berges, C. Bowler, et al. 2004. The genome of the diatom Thalassiosira pseudonana: Ecology, evolution, and metabolism. Science 306: 79-86. Retrieved August 22, 2008. Bradbury, J. 2004. Nature's nanotechnologists: Unveiling the secrets of diatoms. PLoS Biology 2: 1512-1515. Retrieved August 22, 2008. Canter-Lund, H., and J. W. G. Lund. 1995. Freshwater Algae. Biopress Limited. ISBN 0948737255. Chamberlain, C. 1901. Methods in Plant Histology. Chicago: University of Chicago Press. Drum, R. W., and R. Gordon. 2003. Star Trek replicators and diatom nanotechnology. Trends Biotechnology 21: 325–328. Retrieved August 22, 2008. Dugdale, R. C., and F. P. Wilkerson. 1998. Silicate regulation of new production in the equatorial Pacific upwelling. Nature 391: 270-273. Retrieved August 22, 2008. Egge, J. K., and D. L. Aksnes. 1992. Silicate as regulating nutrient in phytoplankton competition. Mar. Ecol. Prog. Ser. 83: 281-289. Retrieved August 22, 2008. Furnas, M. J. 1990. In situ growth rates of marine phytoplankton: Approaches to measurement, community and species growth rates. J. Plankton Res. 12: 1117-1151. Retrieved August 22, 2008. Grenne, T., and J. F. Slack. 2003. Paleozoic and Mesozoic silica-rich seawater: Evidence from hematitic chert (jasper) deposits. Geology 31: 319-322. Retrieved August 22, 2008. Harper, H. E., and A. H. Knoll. 1975. Silica, diatoms, and Cenozoic radiolarian evolution. Geology 3: 175-177. Retrieved August 22, 2008. Hoek, C. van den, D. G. Mann, and H. M. Jahns. 1995. Algae: An introduction to phycology. Cambridge University Press. ISBN 0521316871. Kidder, D. L., and D. H. Erwin. 2001. Secular distribution of biogenic silica through the Phanerozoic: Comparison of silica-replaced fossils and bedded cherts at the series level. J. Geol. 109: 509-522. Retrieved August 22, 2008. Kooistra, W. H. C. F., and L. K. Medlin. 1996. Evolution of the diatoms (Bacillariophyta): IV. 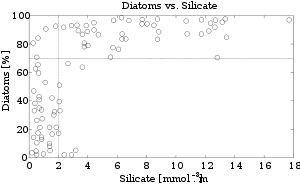 A reconstruction of their age from small subunit rRNA coding regions and the fossil record. Mol. Phylogenet. Evol. 6: 391-407. Maheswari, U., A. Montsant, J. Goll, S. Krishnasamy, K. R. Rajyashri, V. M. Patell, and C. Bowler. 2005. The Diatom EST Database. Nucleic Acids Research 33: 344–347. Retrieved August 22, 2008. Maldonado, M., M. C. Carmona, J. M. Uriz, and A. Cruzado. 1999. Decline in Mesozoic reef-building sponges explained by silicate limitation. Nature 401: 785-788. Retrieved August 22, 2008. Mann, D. G. 1999. The species concept in diatoms. Phycologia 38: 437-495. Retrieved August 22, 2008. Medlin, L. K., W. H. C. F. Kooistra, R. Gersonde, P. A. Sims, and U. Wellbrock. 1997. Is the origin of the diatoms related to the end-Permian mass extinction? Nova Hedwegia 65: 1-11. Milligan, A. J., and F. M. M. Morel. 2002. A proton buffering role for silica in diatoms. Science 297: 1848-1850. Retrieved August 22, 2008. Montsant, A., K. Jabbari, U. Maheswari, and C. Bowler. 2005. Comparative genomics of the pennate diatom Phaeodactylum tricornutum. Plant Physiology 137: 500-513. Retrieved August 22, 2008. Racki, G., and F. Cordey. 2000. Radiolarian palaeoecology and radiolarites: Is the present the key to the past? Earth-Science Reviews 52: 83-120. Raven, J. A. 1983. The transport and function of silicon in plants. Biol. Rev. 58: 179-207. Raven, J. A., and A. M. Waite. 2004. The evolution of silicification in diatoms: Inescapable sinking and sinking as escape? New Phytologist 162: 45-61. Round, F. E., R. M. Crawford, and D. G. Mann. 1990. The Diatoms. Biology and Morphology of the Genera. Cambridge University Press. ISBN 0521363187. Scala, S., N. Carels, A. Falciatore, M. L. Chiusano, and C. Bowler. 2002. Genome properties of the diatom Phaeodactylum tricornutum. Plant Physiology 129: 993-1002. Retrieved August 22, 2008. Schieber, J., D. Krinsley, and L. Riciputi. 2000. Diagenetic origin of quartz silt in mudstones and implications for silica cycling. Nature 406: 981-985. Retrieved August 22, 2008. Siever, R. 1991. Silica in the oceans: Biological-geological interplay. Pages 287-295 in S. H. Schneider, and P. H. Boston, eds., Scientists On Gaia. Cambridge, MA: MIT Press. ISBN 0262193108. Smetacek, V. S. 1985. Role of sinking in diatom life-history cycles: Ecological, evolutionary and geological significance. Mar. Biol. 84: 239-251. Retrieved August 22, 2008. Tréguer, P., D. M. Nelson, A. J. Van Bennekom, D. J. DeMaster, A. Leynaert, and B. Queguiner. 1995. The silica balance in the world ocean: A reestimate. Science 268: 375-379. Retrieved August 22, 2008. Yool, A., and T. Tyrrell. 2003. Role of diatoms in regulating the ocean's silicon cycle. Global Biogeochemical Cycles 17: 1103. Retrieved August 22, 2008. Computer simulations of pattern formation in diatoms. Diatom Genome – Joint Genome Institute. Diatom EST database – École Normale Supérieure. Life History and Ecology of Diatoms – University of California Museum of Paleontology. This page was last modified on 24 October 2017, at 20:41.